Block, Geoffrey. Charles Ives: a bio-bibliography. New York: Greenwood Press, 1988. Burkholder, J. Peter. Charles Ives: The Ideas Behind the Music. New Haven: Yale University Press, 1985. Burkholder, J. Peter. All Made of Tunes: Charles Ives and the Uses of Musical Borrowing. New Haven: Yale University Press, 1995. Burkholder, J. Peter. & Geoffrey Block. Charles Ives and the Classical Tradition. New Haven: Yale University, 1996. Burkholder, J. Peter. Charles Ives and His World. Princeton: Princeton University, 1996. Cowell, Henry; Sidney Cowell . Charles Ives and His Music. Oxford: OUP, 1969. Feder, Stuart. "My Father's Song": A Psychoanalytic Biography. New Haven: Yale University Press, 1992. Hitchcock, H. Wiley. 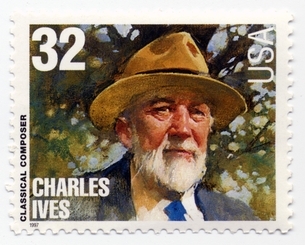 Ives: A Survey of the Music. Brooklyn: Institute for Studies in American Music, 1983. Kirkpatrick, John, ed. Charles Ives Memos: A Source Book Incorporating all the most important unpublished writings of America’s Great Composer. New York: W. W. Norton, 1972. Johnson, Timothy. Baseball and the Music of Charles Ives: A Proving Ground. Lanham, Maryland: The Scarecrow Press, 2004. Perlis, Vivian. Charles Ives Remembered: An Oral History. New Haven: Yale University Press, 1974. Starr, Larry. A Union of Diversities: Style in the Music of Charles Ives. New York: Schirmer, 1992. Sinclair, James B. A Descriptive Catalogue of the Music of Charles Ives. New Haven: Yale University Press, 1999. Swafford, Jan. Charles Ives: A Life with Music. New York: W.W. Norton, 1996. Woolridge, David. From the Steeples and Mountains: A Study of Charles Ives. New York: Alfred A. Knopf, 1974.